Response card: Handmade green-colored lokta cardstock. An Evocative and Sophisticated Wedding Invitation for a Garden, Seaside or Green Wedding. DIY Square Invitation of green-colored handmade lokta paper from Nepal. Do it yourself assembly, you can print or we can print for you. Elegant green-colored booklet of beautiful handmade lokta paper from Nepal. Bound with waxed linen thread. Very natural yet sophisticated. Invitation is book style - with two facing pages (like a book). Cover has an inside pocket for enclosures. Closes with a sprig of real Edelweiss (leontopodium alpinum). Booklet is entirely tree free. 100% post consumer recycled paper envelope. (made in USA) Colors are natural light tan and cool green. ASSEMBLY: MEDIUM SKILL BUT TAKES SOME TIME. Finished invitation measures 6-1/8" x 6-1/8"
Invitation Sheet: Natural lokta printing sheet. Prints inkjet or laser beautifully. Invitation Wrapper:Granny Smith apple green handmade lokta paper. Scored. Invitation Printing Sheet:Natural handmade lokta paper - prints inkjet and laser beautifully. 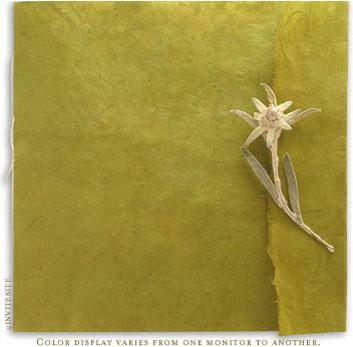 Pressed Flower:Edelweiss with stem . Envelope: Natural 100% post consumer recycled 70 lb square envelope. Envelope Liner:Green mango leaf and mulberry paper. Templates:Templates in Microsoft Word if you plan to print these yourself.